In my search for something fun to post for Friday, I came across this post that I did on a now defunct blog about 10 years ago. I thought it was interesting enough to repeat here – and just so you know, the last line still holds true. A long time ago (and we’re talking a very long time ago), someone I was very close to told me I was nothing but a dreamer. At the time, the comment hurt. It was a careless comment made to a child, and yet it stuck with me for years. In the summer of 1816, nineteen-year-old Mary Wollstonecraft Godwin and her lover, the poet Percy Shelley (whom she married later that year), visited the poet Lord Byron at his villa beside Lake Geneva in Switzerland. Stormy weather frequently forced them indoors, where they and Byron's other guests sometimes read from a volume of ghost stories. One evening, Byron challenged his guests to each write one themselves. Mary's story, inspired by a dream, became Frankenstein. "When I placed my head upon my pillow, I did not sleep, nor could I be said to think... I saw -- with shut eyes, but acute mental vision -- I saw the pale student of unhallowed arts kneeling beside the thing he had put together. I saw the hideous phantasm of a man stretched out, and then, on the working of some powerful engine, show signs of life, and stir with an uneasy, half-vital motion. Frightful must it be; for supremely frightful would be the effect of any human endeavor to mock the stupendous Creator of the world. ...I opened mine in terror. The idea so possessed my mind, that a thrill of fear ran through me, and I wished to exchange the ghastly image of my fancy for the realities around. ...I could not so easily get rid of my hideous phantom; still it haunted me. I must try to think of something else. I recurred to my ghost story -- my tiresome, unlucky ghost story! O! if I could only contrive one which would frighten my reader as I myself had been frightened that night!" The novelist Robert Louis Stevenson (1850-1894) described dreams as occurring in "that small theater of the brain which we keep brightly lighted all night long." His wife related picturesquely how one night Louis cried out horror-stricken, how she woke him up and he protested, "Why did you waken me? I was dreaming a fine bogy-tale!" She also related how he appeared the next morning excitedly exclaiming, "I have got my schilling-shocker -- I have got my schilling-shocker!" Stevenson wrote extensively about how his passion for writing interacted with his remarkable dreams and said that, from an early age, his dreams were so vivid and moving that they were more entertaining to him personally than any literature. He learned early in his life that he could dream complete stories and that he could even go back to the same dreams on succeeding nights to give them a different ending. Later he trained himself to remember his dreams and to dream plots for his books. Nicholls: "If the inspiration for Misery didn't come from a real-life incident, where did it come from?" King: "Like the ideas for some of my other novels, that came to me in a dream. In fact, it happened when I was on Concord, flying over here, to Brown's. I fell asleep on the plane, and dreamt about a woman who held a writer prisoner and killed him, skinned him, fed the remains to her pig and bound his novel in human skin. His skin, the writer's skin. I said to myself, 'I have to write this story.' Of course, the plot changed quite a bit in the telling. But I wrote the first forty or fifty pages right on the landing here, between the ground floor and the first floor of the hotel." "Another time, when I got road-blocked in my novel It, I had a dream about leeches inside discarded refrigerators. I immediately woke up and thought, 'That is where this is supposed to go.' Dreams are just another part of life. To me, it's like seeing something on the street you can use in your fiction. You take it and plug it right in. Writers are scavengers by nature." I think the most surprising thing about Keats, to me at least, is that his poetry career only lasted three and a half years. He wrote more than 150 poems in that short time – just think what he might have accomplished had he lived! His parents died when he was 15 and the following year he was apprenticed to an apothecary-surgeon. Keats found the medical profession not to be his liking and published his first volume of poetry in 1817. The following year wrote and published Endymion, which was based on the Greek myth of the shepherd beloved by the moon. His final volume of work was published in 1820, and he died of tuberculosis early in the following year. There are actually two versions of the poem I’ve chosen for today. The first was penned by Keats in 1819, and the second was the published in 1820 and it’s somewhat of a mystery as to who changed it or why. But never fear, I’m only going to include one version here. 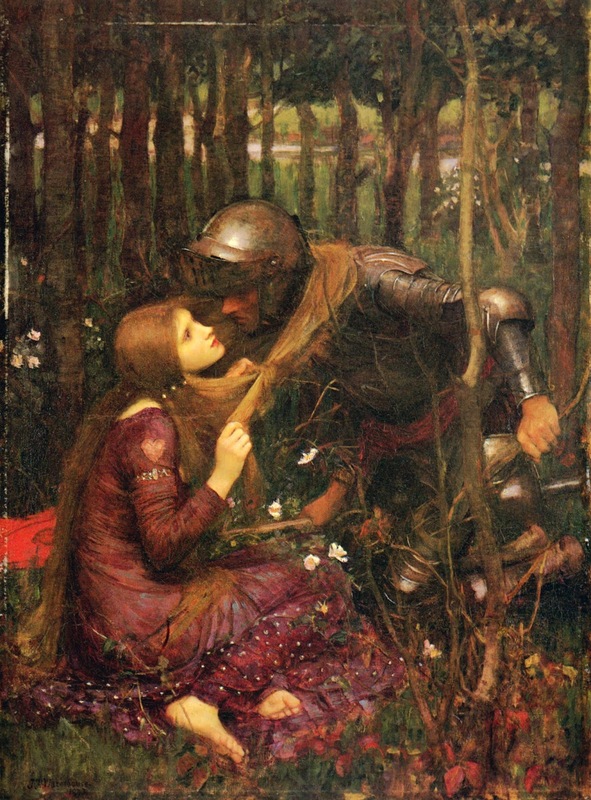 A couple of things worth noting, La Belle Dame Sans Merci translates to beautiful lady without mercy and the original version was included in a letter to Keats’ brother George. 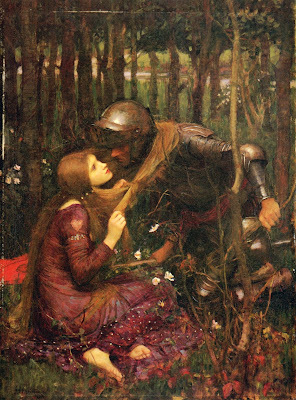 Also, the famous pre-Raphaelite artist John William Waterhouse was inspired by the poem to create one of his most famous works. I wasn’t sure about breaking down the word sprints (and FYI, it’s only a word war if you’re writing against someone; if you’re just writing against the clock then it’s a word sprint) but I found the range of wordage kind of interesting. I know what you’re thinking. You’re probably thinking pretty much the same thing I am. Wow, 2900 words for a whole week isn’t really that great. But it’s better than I’ve been doing all year, so shut up. 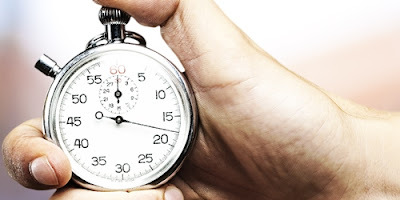 Plus a word sprint is 30 minutes, so those daily totals are for 30 minutes of writing each. The weekend was supposed to be for editing, and as you can see I only did a little over an hour’s worth of it. I’ve been trying to adjust to a new medication and it seriously knocks the stuffing out of me for at least a day, which was Saturday, and then Sunday I kind wrote over 2300 words (which will be added to next week’s total) instead of editing. What can I say? The ending of the new WIP I’m working on came to me as I was falling asleep Saturday night and it was good enough that I remembered most of it in the morning. And you notice I’m calculating my editing by time spent instead of pages finished? It just seemed to make sense. And I have to admit to being a little curious as to how much time I spend editing something. I’ll bet the total time when I’m done will staggering. To help in this I downloaded a nifty little program called TraxTime. With it you can log the amount of time you spend on your different projects, whether it’s writing or editing. Not only will it keep track of each day’s progress, it’ll keep a running total for you too and you can generate reports, if you’re so inclined. You can try it yourself for free for 30 days, just go HERE and if you want to keep it, it’s only $39.00. I hope you also noticed I fixed my progress bars to the right. As you can see, I took Wandering Wizards all the way back to the beginning. I’m combining both the old words and new as I see fit, which is going to make keeping track of the new words a little problematic. One of my problems last week was that I wrote down my daily word counts, but forgot to make note of which WIP they were for, so when it came to updating my progress bars I was a little uncertain. However, I’ve made a chart to fill in on a daily basis, so hopefully that won’t be a problem any more. 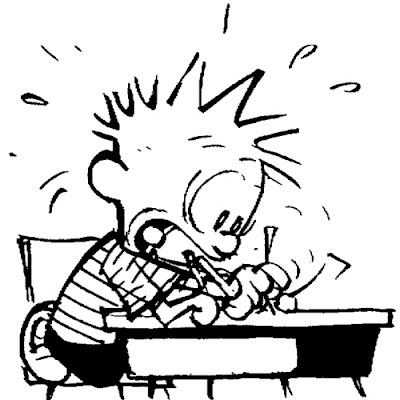 This week: carry on and keep writing! If at first you don’t succeed…keep trying. Hot chocolate with a splash of Bailey’s in it. As part of the new and improved writing me, I figured it was time to get back to my passion for poetry on Wednesdays. 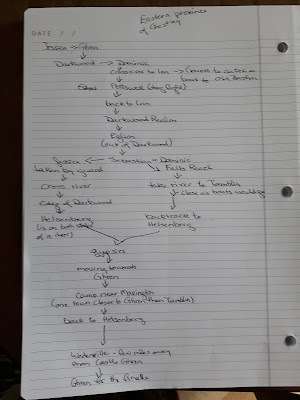 Until I'm really back in the writing groove these posts will probably be a little random - sometimes old poetry, sometimes new, sometimes a form, sometimes a favourite written by someone else - but at least it's a start. Today I'm feeling a little nostalgic . . .
As you know, I’ve been writing poetry for a long time – some good, some bad. I didn’t really get going with poetry until Grade 8, when our Language Arts teacher gave us a prompt each Friday to inspire us to write creatively. Today I thought I’d share a few of the poems I wrote from those prompts. Lies the earth of sandy cream. Stretch their long grey arms to you. The tomb where King Neptune’s lain. Yet, as all dreams, this one must end. The tomb, the shells, the fish must fade. Are now just part of one dream made. Yes you’re right, it’s Jack Frost’s frown. To search its every hold. Tell tales of men so bold. Knows what laid them low. 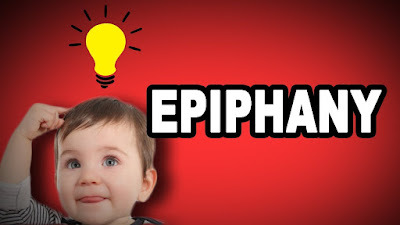 No great epiphanies this week I’m afraid, just some kinda interesting stuff going on. Probably more interesting to me than you, but hear me out and you can decide for yourself. I actually spent more time reading blogs than playing games last week, and while it might not seem like much of an improvement (because I really should have been writing) at least there’s a chance I might learn something from a blog. There’s not much that can be learned from a game, other than the fact that on-line games cheat. Anyway…on a whim I checked out a few of the early posts on my other blog, and by early I mean when I first started it ten years ago. Man, those were the days! The posts were short and random, and I had about three works in progress going at the same time. One of those WIPs was something called “Magic” and I had no idea what it was referring to. Nowhere did I give enough detail as to what it might have been, just word counts and progress reports. And there was nothing titled “Magic” in my old files. It took several more posts before I finally had an “Ah ha!” moment that let me know what I’d changed it to and then all of a sudden I started thinking up all these details for the sequel that never got past the “thinking about it” stage. So Friday, the illustrious Jamie had the day off (she had Thursday off as well, but the torpedoing of that day is her story to tell) so I challenged her to a word war. We actually did two of them, 30 minutes each, and I was pretty amazed at how much you can write in 30 minutes. The first one I started Magic 2 (for want of a better title) for 816 words, and the second I worked on Wandering Wizards for another 689. Pretty good for someone struggling to get her blog posts done on time, eh? But Jamie and I both agreed that the secret is in the timing. It is far easier to accomplish respectable word counts when you tell yourself, “Okay, I’m going to write without stopping for 30 minutes” than it is if you set yourself a goal of X number of words. That being said, I didn’t get any writing done on the weekend, but yesterday, despite being interrupted a couple of times, I still managed 526 words. And seeing as my daily goal is 500 words, that’s a pretty good way to start my day. Of course that’s also why this post is a day late. Yesterday I sat outside on the deck for my breakfast, which kind of put me way behind everything else, and this post kept getting moved down the priority list. But, today I decided to get this done first, then do my word sprint, and now I’m done so off I go. I had another epiphany last week. I figured out where I was went wrong with Wandering Wizards. It wasn’t that I wrote the first 50,000 words during NaNoWriMo, it’s that I wrote it before the previous book was finished. I had no idea what was happening/going to happen to Jessica before the end of Lucky Dog so I really didn’t know what my jumping off point was supposed to be. 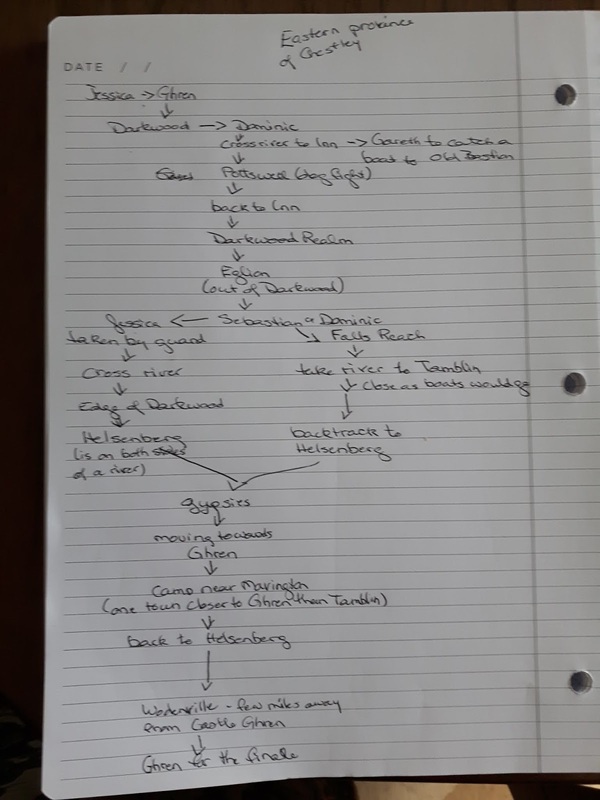 After mapping out where my characters have been, I did a second word map to figure out where they’re going, and while it’s not a pretty as one of the spiffy maps I drew years ago, it’ll give me an idea of what goes where (or maybe that should be who goes where). One of these days I may get around to doing an actual map, but it’s not a priority. Anyway, now that I know what I’m doing (more or less), I’m starting over with Wandering Wizards. I have a clean document file in which I will cut/paste the sections of the previous version that are usable (surely some of those nearly 60,000 words are worth saving) while at the same time adding new stuff that will help the whole thing make sense. The only problem I foresee is having to edit as I go because the old stuff will need to be changed somewhat to fit with the new and that’s not a job I’m going to want to tackle when the whole thing is done. As of the end of last week I’ve added about 1500 new words to the first couple of chapters and I must say – so far, so good. The section in between still needs some editing, but not too much (I hope). The old section was an entire chapter and I might have to split it up – actually, it might read better split up so I’ve got the old and the new twisting around each other so you’re not getting big chunks of either. Hmm…. I function better when I have a routine to stick to. I know this, and yet I continue to waste a lot of time that could be put to better use if I just had an idea of what to do with it. I’m not just talking writing, either. I’m talking about all the mundane things we have to deal with. I need to go back to making a list. I like lists. I really like being able to cross things off of a list. But a list not only lets you see at a glance everything that needs to get done, it’s also a reminder that you have better things to do than sit there playing Bubble Mouse for hours on end (or is that just me?). I’m actually going to need two lists: one made on Sunday nights for what I want/need to accomplish in the week ahead, and one made at the end of the week for what I want/need to accomplish on the weekend. But back to routines…. It’s just cool enough in my office that I can work in there for a couple of hours in the morning, Both times I worked in my office in the morning last week I got words done on WW., so office time is going to be part of my morning routine. I was checking out some old files and I’m kind of appalled at the amount of flash fiction I have. Enough to fill a couple of volumes I’d say…if they were finished/polished. So as part of my new routine I’m going to pick one flash story a week, finish it, polish it, and – here’s the hard part – shop it around. If nobody wants it but I still like it, I’ll set it aside until I have enough to do an anthology. One way or another, these stories have to start earning their disk space. So. We have spending mornings in my office, finishing up one story a week, and making lists. I’m sure it looks easier than it’ll be, but I’m going to give it a try.